Williamsburg is part of the NY Hoods collection. 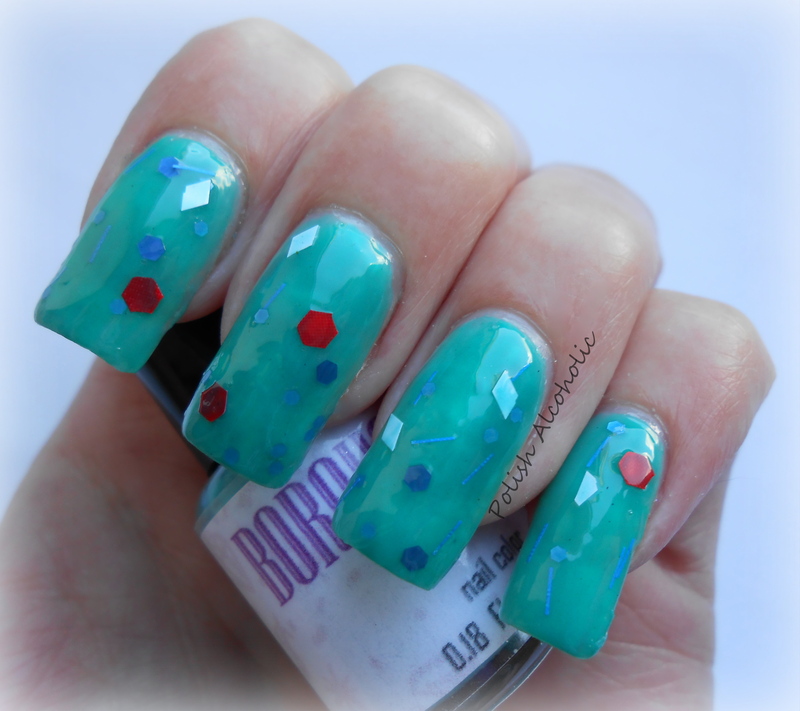 It’s a turquoise jelly base filled with a mix of different shapes of (matte) white, red, purple and blue glitter. I layered one coat of Williamsburg over one coat of a bright green polish (Surfing Crocodile by ANNY). The formula is fine. Application went easy by using the dabbing technique. I advice a good shake before use. Brunch at Tiff’s is a light blue almost milky base with gold, silver and fluoresecent glitter. The formula of this is also fine. I used two coats of Brunch at Tiff’s over a ‘dirty’ green base (Wicked by ANNY). This entry was posted in Indie and tagged borough babe black as night, borough babe brunch at tiff's, borough babe swatches, borough babe williamsburg, hand blended nail polish, indie, indie nail polish, indie polish by Polish Alcoholic. Bookmark the permalink. Yep Black as Night is my fave too! But hey Brunch at Tiff’s is also a beauty. Love the Brunch at Tiffs. Thanks, that’s my fave too 🙂 And yeah wish I lived in the US too! I tried one Borough Babe polish and I loooove it! I like that so many are jellies! I want to swim in jelly!! Oh wow, I like the black one!! Thanks 🙂 That’s my fave!